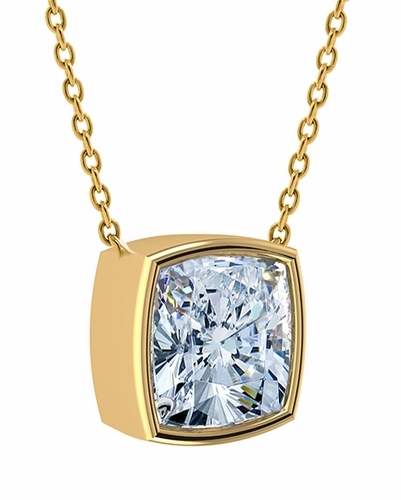 The 1 Carat Cushion Cut Square Bezel Set Cubic Zirconia 14k Yellow Gold Solitaire Pendant features a square shape with softly curved sides that provide a delicate and intriguing fine diamond look. Created from the original Russian formula with its 104 sparkling facets, it shines and shimmers even in the lowest levels of light. 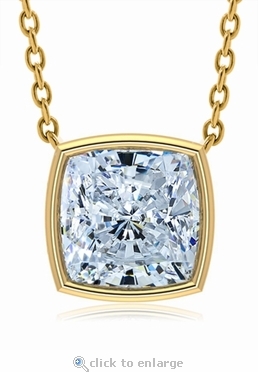 A stylish addition to your fine jewelry collection, the brilliant 1 carat cushion cut 6mm solitaire style station type necklace is placed in a bezel set tube like framed mounting, encasing the entire depth of the rectangular shaped diamond look cubic zirconia stone, allowing it to lay flat against the chest and face forward. 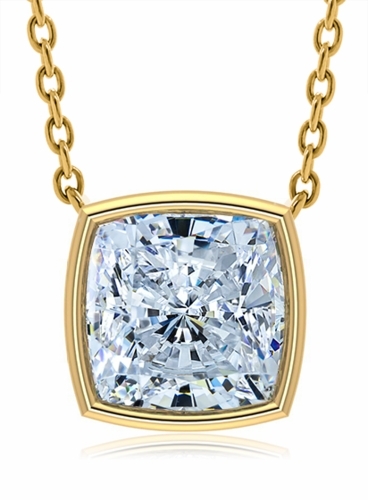 A delicate 16 inch fine rope chain is affixed and attached to each side of the bezel accentuating the beauty of the bezel setting, creating the look of a stationary floating solitaire pendant. This solitaire pendant can be worn from day to night, casual or formal and make the perfect gift for that special someone. For further assistance please call us directly at 1-866-942-6663 to speak with a knowledgeable representative or communicate with us via live chat.